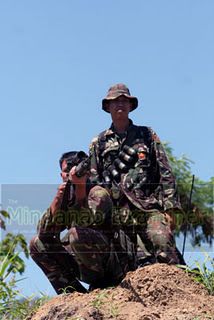 MARAWI CITY (Mindanao Examiner / Nov. 3, 2011) – Philippine troops arrested a man transporting munitions for a sniper rifle in the Muslim province of Lanao del Sur in Mindanao, officials said on Thursday. Officials said the soldiers, from the Army’s 65th Infantry Battalion, were manning a checkpoint when they stopped a vehicle for an inspection and discovered the 200 rounds of .50-caliber ammunition. The 26-year old man, Alexander Macanas, told military interrogators that he was only paid to transport the munitions. He said an unidentified man bought the bullets. “We are still investigating him about the ammo and we will file charges against Macanas,” Colonel Daniel Lucero, commander of the 103rd Infantry Brigade, told the Mindanao Examiner.